LPJ Design [visit their website here] has launched a new Pathfinder supplement series, Leader of the Pack, providing leader NPCs, starting with Humanoids. “Tired of sending wave after wave of mooks at your PCs? Don’t have time to stat out the leader of your monstrous tribe? The Leaders of the Pack series provides GMs with unique leaders for the hordes, tribes, and armies of monsters in their campaigns. These NPCs work great as individual threats, and they make particularly dangerous teams when paired together. Add in a handful (or two) of minions and your players will be begging for mercy! Leaders of the Pack: Humanoid includes two distinct leaders for each type of monster presented: bugbears, gnolls, goblins, hobgoblins, and orcs. Each entry includes a full stat block, combat tactics, suggested plot hooks, and sample encounters of varying levels.” Written by Mike Kimmel, it’s available for purchase from DriveThruRPG: Leader of the Pack: Humanoids (PFRPG). EN Publishing [visit their website here] has released the second module in their sci-fi fantasy adventure path for Pathfinder, Santiago – Belladonna, Nightshade, and the Sargasso Rose. “Belladonna, Nightshade and the Sargasso Rose brings the heroes into a deeper plot. Fresh from their meeting with the raconteur Stern on Port Étrange, the party sets course for the planet of Belladonna, where they hope to meet with Duncan Black and learn more about their ultimate quarry, Santiago. After their first encounter with the Democracy, they’ll finally meet the Sargasso Rose, whose information will prove invaluable as they continue their hunt and set them on a crash course for planets mysterious and people even more so.” Written by Mike Resnick and Malcolm Northwinter, it’s available for purchase from DriveThruRPG: SANTIAGO AP #2: Belladonna, Nightshade, and the Sargasso Rose (PATHFINDER RPG). Adventureaweek [visit their website here] has released a Fantasy Grounds II module for their Rybalka setting for Pathfinder. “Dive into Rybalka and the surrounding environs with the first ever AaW Campaign Setting release! This Fantasy Grounds II module includes all locations, characters, maps, and images in relation to Rybalka appearing thus far on the AaW site and in adventure releases.” Designed by Jonathan G. Nelson, Stephen Yeardley, Joshua Gullion, Todd Gamble, Nathan Land, Cory Vickruck, Oliver Volland, and Will Myers, it’s available for purchase from DriveThruRPG: FGCS1: Rybalka for Fantasy Grounds II. Funhaver Industries [visit their website here] has released a new character class for Dungeon World – The Assassin. “They say your trade is the second oldest there is. You can’t be sure, but you see no reason to doubt them: in your experience, there are always people willing to exchange money for murder. Power, conviction, cruelty, wealth—all end equally at the point of a knife. All it takes is a simple transaction.” Written by Alex Norris, it’s available for purchase from DriveThruRPG: The Assassin – A Dungeon World Class. 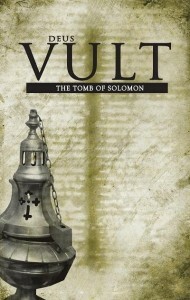 Mongoose Publishing has released another new adventure module for Deus Vult – The Tomb of Solomon [view our entry in the Roleplayers Chronicle Reference database here]. “Legend holds that Solomon, son of David and king of the Jews, had in his possession a magical ring that gave him power over demons and spirits. He imprisoned these spirits and sealed them away forever, so they would trouble humanity no more – and every word of this legend is true.” Written by Gareth Hanrahan, it’s available for purchase from DriveThruRPG: Legend/Deus Vult: The Tomb of Solomon. Gypsy Knights Games [visit their website here] has released a new frontier colony for Traveller – Peel Colonies. “The Peel Colonies are the only settled worlds in Ariel Sector. Located to coreward of Clement Sector, Peel Subsector is the cutting edge of colonization into this new sector. The last stops before heading into the unknown!” Written by John Watts, it’s available for purchase from DriveThruRPG: Peel Colonies. Orcs Unlimited [visit their website here] has released an epic fantasy satire RPG – Escape from Teddy Bear Island. “Are you looking for a fun, simple pen and paper role playing game? Would you like to get out your aggression by killing evil stuffed animals? You are in luck! Set on an island over run by evil animated Stuffed animals. You are given the choice to run or fight. Either way you will probably die at the hands of a cuddly Plushie. Grab some players, dice, and get ready for the fight of your life as you Escape from Teddy Bear Island!” Written by Patrick McNary and Jennifer McNary, it’s available for purchase from DriveThruRPG: Escape from Teddy Bear Island. WildFire [visit their website here] has released the second Stygian Cycle campaign book for their Cthulhu sci-fi horror RPG, The Void – Venusian Sunset. “2159 AD. Something approaches, a thing on an orbit from far away. Seemingly a mysterious shard of dark matter, this object is known in obscure prophecy as the Chthonian Star. It is awakening things long thought lost or dead, things that have slumbered awaiting its return. The Unified World Council sends out special teams of sanctioned Wardens, whose job it is to ascertain the new threats to human life, to learn everything they can about them, and fight them wherever they are found.” Written by Christopher Dorn, Robert Glass, Matthew Grau, and Fraser McKay, it’s available for purchase from DriveThruRPG: The Void – Stygian Cycle II. Third Eye Games has released their first Care Package for the modern fantasy Camp Myth [view our entry in the Roleplayers Chronicle Reference database here]. “Welcome to Camp Myth: The RPG. Your first care package has arrived with all kinds of goodies for you and your game.” Written by Chris Lewis Carter, it’s available for purchase from DriveThruRPG: Care Package #1 (for Camp Myth: The RPG). SteamLogic [visit their website here] has released a free Introduction supplement to their dark fantasy steampunk RPG Mechanical Dream. “You will learn about these races, from which are born Echoes – Heroes who can grow to extreme levels of power. You will learn how they cope with an ever shifting reality, how they manage to stabilize it, and how they live with the Dream (the “Nocturne”). You willl learn about Orpee, the food of survival, and how this incredibly rough universe somehow manages to be survived through wits and courage, be it in the incredibly huge City-States built on mile high trees, or in the wilderness, fighting beasts from a bygone era!” Written by Benjamin Paquette and Francis Larose, it’s available for download from DriveThruRPG: Mechanical Dream:Introduction. Peryton Publishing [visit their website here] has released a modern horror adventure module for Crawlspace 13 – Party Nights. “The scientists at the Steinhold-Brensji Radio and Atmospheric Laboratories have stumbled across an anomaly in the night sky. At certain times, an asteroid the size of New Jersey is in orbit between the Earth and the moon. One can say that the celestial body, called “the Blind Spot,” only appears when the stars are right. But when it is there, what we’d call paranormal occurrences occur, and supernatural entities can take a hold of our world.” Written by Tom K. Loney, it’s available for purchase from DriveThruRPG: Party Nights [Crawlspace]. DramaScape has released their latest modern battlemap – Street Ball [view our entry in the Roleplayers Chronicle Reference database here]. “Street ball is a single map of an urban basketball half court (One basket only). Street ball is intended for use in modern or near future science fiction settings.” Designed by Simon Powell, Steven Black, and Vidar Edland, it’s available for purchase from DriveThruRPG: Street Ball.